We all want to be in control but none of us wants to be controlled. That’s a basic truth about control that we all live by. Managers seek to control their employees – to get them to do whatever it is the organization needs from them. Parents seek to control their children and get them to behave in a way that the parent believes is appropriate. Pastors try to control their congregations into honorable behaviors. Politicians try to control the constituents into attitudes that improve society – or increase the probability for reelection. 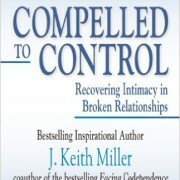 The book Compelled to Control seeks to explore how controlling – and codependency – impact relationships between people, particularly intimate relationships. Control isn’t good or bad in and of itself – it’s really about the motivations behind the control that are the challenge. This is the sort of view that the Dalai Lama and Paul Ekman came to share in Emotional Awareness. In other words, it’s less about the control and it’s more about the reason for the control and the extent of the control. Control can be a problem because sometimes control is used to hide our own feelings of inadequacy. 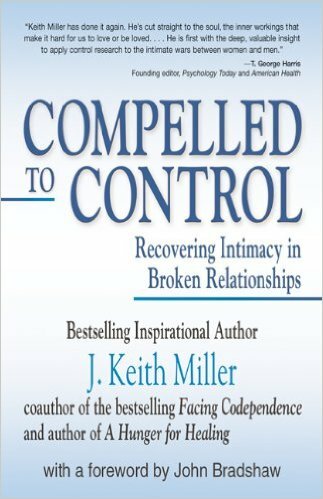 The author, J. Keith Miller, asserts that the issues around control are really centered on our ability to manage our self-esteem. We control others to prevent them from seeing how unworthy we are, or to make them feel as unworthy as we are. We have all put others down – even friends – when they were doing something better than we were. Our discomfort in our ability leads us to lash out towards those around us. However, we are all, by virtue of our birth, equally valuable and equally entitled to the respect of others. This worthiness isn’t something that has to be earned. We don’t become worthy after we’ve done so many good deeds any more than we become unworthy of basic human rights if we do something bad. However, most of us struggle with the desire to be a “human doing” rather than a “human being.” We fill our schedules – sometimes with noble endeavors – to help us numb our feeling of inadequacy or to help us believe that we deserve to feel better. At the heart of this lack of feeling worthy is the reality that most of us feel like we have experienced conditional love and are always seeking to maintain or get that level of love back once again. The love we felt from our parents, relatives, spouses, etc., has been based on what we’ve done for them or our submission to their control. The love we felt is not a fundamentally about who we are. This creates a struggle with our self-image. We desire to be worthy of love but know that there are parts of us that don’t measure up. This can be particularly difficult if we’ve created a perception of ourselves with others that is radically different than who we feel we are inside. This creates the “must-be-seen-as box” that was discussed in the Anatomy of Peace. We have to maintain the disconnection between who we really are and how others see us. This increases the importance of controlling others so that they don’t discover the disconnection. More insidious, however, is the fact that the stress of maintaining this control and knowing that control is really an illusion, that we don’t have control of anything in our lives, much less in others, means the constant fear of being discovered and the anxiety that results from it. We can’t battle the anxiety in our lives if we don’t face – or eliminate – our fears. We can’t eliminate our fears if we deny they exist or if we deny the reality of the world that we live in. Without learning how to face our fears, we’ll slip into being controlled by them. Once we’re controlled by fear, we’ll seek to control others in unhealthy ways. The problem is that sometimes when we talk about the tools of control – chief among them being shaming and reality distortion – they’re not always bad. Classic books like Dale Carnegie’s, How to Win Friends and Influence People, and dozens of other current titles, teach techniques for controlling and manipulating those around you. We want to control how people see us, respond to us, and love us. We want techniques for manipulating the outcome. At the core, control is trying to influence the natural outcomes. It is trying to bias the results in one way or another. With that definition in mind it’s easy to see that we all control. The real question is whether we exercise an appropriate or an inappropriate level of control. Control problems are a perversion of the natural, healthy, and basic drive to control our environment. As humans we’ve managed to conquer the world that we live in. We’ve developed plumbing and septic systems to keep us healthy, roads to help us get from one place to another, and a variety of technologies that make our lives safer and longer. These are all ways that we’re controlling our environment to make it better for humankind. However, just as drinking to excess makes you an alcoholic, continuous and overbearing control can make you controlling. The delicate point to consider is whether the ways that you’re shaping your world are too much about other people and too little about you. It is my belief (in part created by Compelled to Control) that the first step in determining whether control is healthy or not is to determine the relationship that you have with the person that you’re exerting control over. Is the relationship a peer-to-peer relationship or is it a one-up/one-down relationship? A one-up/one-down relationship would be a parent/child relationship or a manager/employee relationship. These are relationships where the balance of power in the relationship is intentionally and structurally skewed. Peer-to-peer, which is generally easier to understand, would be something like your relationship with your spouse or siblings. In a work context, a peer-to-peer relationship might refer to someone who is literally another member of your team and thus your peer – or someone outside of your sphere of influence in the organization but not directly above you. In peer-to-peer relationships, control should be very limited, and focused on your boundaries. In a one-up/one-down scenario, the control is likely to be much more overt and direct. A manager may literally tell the employee what to do. A parent of a young child is expected to tell their children what and what not to do. Most of our relationships are peer-to-peer relationships, as the other people are outside of our sphere of influence. Definitions for intimacy vary along a theme as do definitions for control. Intimacy is often described as two (or more) people sharing their reality without undue fear of rejection or retaliation. This definition of intimacy, though possible to refine, is quite good. The key to this definition is the sharing of our reality. None of us experiences the world exactly as it is. We experience our perception of the world. We experience a mental model constructed in our minds about how the world works. Each of our realities is a bit different because of our different experiences which have shaped our world view. A nurse in the critical care unit of a pediatric hospital may have a perception of reality that includes the idea that bouncing on a bed makes you fall off and falling off gives you a brain tumor – because the kids with brain tumors always seem to have been discovered when they fell off a bed after jumping on it. Sure, to an objective person, this doesn’t match our reality because that’s not our experience – however, if this is all you see every day you’ll start to wonder about the connection too. At the center of our perceptions – of our realities – is the true reality. At the center is the way the world really is. In intimate relationships we’re seeking an understanding of another person’s reality to get closer to them and closer to the true reality. The reason that control is a barrier to intimacy is because control uses the weapon of reality distortion to accomplish the goal. If you can’t see your best perception of reality and those you’re trying to control can’t see their best perception of reality – what hope do you have for common ground? Reality is the reference point for intimate relationships and when you’re spending time distorting it you move the goal further away. The opposite of a controlling relationship is described in How to Be an Adult in Relationships; it is a relationship filled with acceptance and allowing. That is accepting that the other person’s view of reality is different and not trying to change it. There are things about every person that we’re in a relationship with that we don’t enjoy. There’s something about them that makes them different than us. Maybe it’s their obsession with time – or always being late. Possibly it’s their tendency to be involved too much in other people’s lives – or they spend too much time on their own. The beauty of a relationship is that the other person isn’t us. They have differences that can be gifts – or those differences can be annoying. In the context of allowing, the differences are framed as gifts. Baloo in the Jungle Book sings about accentuating the positive and eliminating the negative. One could see this as reality distortion – after all, he’s talking about eliminating the negative. However, an alternative is to view this as framing the situation. Distorting reality is bad – but framing things in a positive light is a good thing. Optimism allows you to be happier by deciding that things are really more positive than they are negative. In other words, the glass is half full. In allowing relationships, you focus on the idea that the other person can bring out the best in you through their differences. If your spouse is more social than you are, they’re also more likely to remember birthdays. If you’re more frequently on time you can help your spouse be late less often. It’s all about some give and take. That is, unless you choose to try to make the difference into a character defect. Another way to inhibit intimacy is to make the other person feel unworthy of connection. Someone who is unworthy cannot share their reality. They can’t become vulnerable enough to allow their reality and themselves to be seen. So shame becomes the second weapon of control. By making someone feel like they’re unworthy you can subject them to your control because – after all – you’re doing them a favor just by associating with them. In my review of Beyond Boundaries, I spoke about integrated self-images. That is realizing that we are both good and bad and trying to integrate those into a single image of ourselves. Being able to create an integrated self-image is a great way to build up immunity to those who seek to control us through shame because there is so much clarity to our self-image and so much reality to it that it becomes difficult for others to manipulate our image into a position of shame. With an integrated self-image you already know that you do bad things and you accept – but don’t like – that you do them. You realize that you’re not perfect and that you’re trying to grow. You allow yourself grace to continue the journey to become better. When someone points out something that you’ve done for which you feel guilty, you’re unlikely to accept that that the error makes you a bad person, Because you already know who you are you are more able to reject that you’re a bad person – you are a good person who makes mistakes. Converting guilt into shame is the secret art that controlling people have learned. It’s not about you doing bad things, it’s that you’re a bad person. That shift seems subtle to the automatic subconscious parts of our mind (See Thinking, Fast and Slow). The immunity from these secret arts comes in that unified self-image, through a self-actualization that realizes that you are both good and bad. The key problem with shame is that you believe that you are who you are. You can’t change your core makeup, your core being. On the one hand, you have traditional psychology saying that you can’t change your core desires. On the other hand, there’s the whole industry of self-help books trying to convince you that you can change. The truth lies between these two extremes. If we go back to Mindset, we realize that people are changeable and, in fact, having a view of yourself that you can change is healthy. It’s a way of building shame immunity because you don’t have to stay the person you are – particularly if you don’t like that person. Learning that you don’t have to remain the same allows you the flexibility to evaluate the things you do and determine whether they’re a part of who you are – or if they’re simply something that you’ve done. Knowing that you aren’t the things that you do, that you’re a worthy human being, isn’t always enough to protect you from having someone trying to blame you for their situation or feelings. Blame is trickier because in most cases there’s a reason to accept some ownership for the situation you find yourself in. Blame is externalized guilt. If guilt is believing that you did something bad, then blame is someone else believing that you did something bad – whether you agree or not. Because it’s an external view of you – because it’s someone else’s perception – you have the choice to accept the blame and convert it to guilt or to look down into the core of what’s happening and decide that the blame is misplaced. Sometimes my son says to me that I “made” him angry. When I’m able, I remind him that I can’t make him feel. I take actions and he chooses the emotional response. He’s responsible for owning how he feels and him trying to put that on me doesn’t work. He has to accept that he’s disappointed with me and that has made him angry. (See Destructive Emotions). Blame is most effective with codependents. Codependents readily accept blame for the feelings of their partner. If partners are unhappy it must be their fault. They feel guilty for not remembering to buy their partner’s favorite beer or to turn down the bed or some other tiny thing. Pushing back responsibility for someone else’s feelings and accepting ownership and responsibility for your actions and the direct outcomes is the most effective way to become resistant to blame. Knowing where to draw the boundaries, what you should accept, and what you shouldn’t, starts in childhood with secrets. Paul Tournier, with whom J. Keith Miller studied, created a model for childhood development that included a stage where children start to be able to keep secrets. Very young children are incapable of keeping a secret – that just doesn’t occur to them. So at the second stage of their development, they keep lots of secrets. They’ve learned how to keep a secret, and it’s fun and exciting. It’s a new skill and they want to try it. The third stage of development in the model is an understanding of when it’s important to share secrets and with whom to share them. A child might share some secrets with their best friend. The reason this is important is because the development around secrets drives your ability to become intimate. If you can’t share your secrets with anyone, how can anyone truly understand you, your reality, and your perspective? And without that, how can they become truly intimate with you? Similarly those who can’t keep secrets won’t be trusted with secrets – and won’t get the experience of being intimate with another human being. Experiencing others opening up to you and trying to connect enriches your soul and teaches you how to reach out and be intimate with others as well. Of course, we each learn these lessons at different levels. We draw different lines around when we should – and when we shouldn’t – keep a secret. Those different decisions and the way that our personalities form in childhood teach us to be skunks or turtles. “There are 10 types of people in the world. Those who understand binary and those who don’t” is a favorite t-shirt saying of mine. We like to break the world into two sets – us and them. When it comes to how people process, there may be two different kinds of animals. First, there are the skunks who spew out words like skunks spew out odor. They talk out how they feel. They’ve been taught that talking is intimacy. The other animal is the turtle, who, when confronted with something emotionally charged, will retreat into their shell – and perhaps never share how they feel. There’s a saying in 12-step programs that you’re only as sick as your secrets. It’s probably no surprise that I am not a fan of the turtle approach to processing emotions through solitude. Perhaps more concerning is that John Gottman, an expert on relationships, describes a characteristic of conversation he calls stonewalling, which he describes as devastating to the health of a relationship. Stonewalling is shutting down in a conversation and refusing to participate. Oh, by the way, John’s accuracy rate at describing whether a couple will stay together or not is quoted at 91%. Obviously, turtles would be more prone to this kind of “withdraw and protect” type of response. There’s a bit more to this as I’ll describe when I get to my book review of The Science of Trust. We need to be careful to not cast our pearls before swine – and to process some of the emotional venom that we create – however, we must also find some level of balance to prevent us from turning into turtles and failing to communicate. There’s something that skunks know that turtles don’t. Skunks know that the awful smell will stop. That they’ll be OK. The smell is just a bit of nostril pain – something that’s not going to kill you. When my then wife was pregnant with our son there was a great deal of conversation about the labor process and pain management. During that time we ran across people that didn’t describe the pain of labor as ‘labor pain’ but instead described it as labor signals. Their argument was that it was the body’s way of signaling that labor was in progress. She opted to get an epidural rather than have a philosophical debate about the topic. Similar to labor pains, some people call hunger pains hunger signals. They’re simply signals – albeit strong signals – that you are hungry. Whether you call it hunger pains or hunger signals, you still want to eat – but we as humans tend avoid pain so strongly you might be inclined to overeat if it’s called a pain. This is an interesting and subtle shift that can be useful to us as we go through life. Fundamental to recovery from controlling, or anything else, is going through the pain to get to the other side. Sometimes 12-step programs say that it’s painful before it’s peaceful. There’s an awareness that pain isn’t always bad – it’s not always the enemy. Learning to lean into discomfort (as Brené Brown describes it), is essential to our growth. The more we look at pain as an attention signal and less as a warning, the more that we’ll be able to lean into it – and learn through the process. I don’t want to seem too controlling but I’d like to offer that Compelled to Control is a great classic book on how to manage your controlling tendencies and keep them healthy.